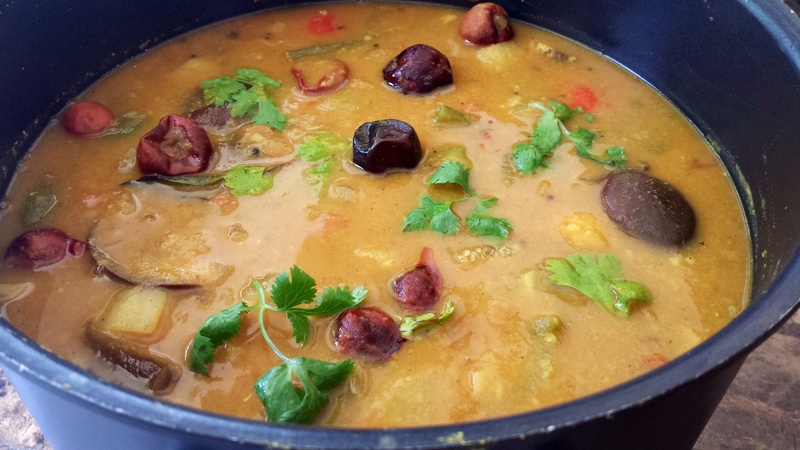 Piping Hot Sambhar a melting pot of interesting ingredients that are spicy, sour and just a hint of sweet! 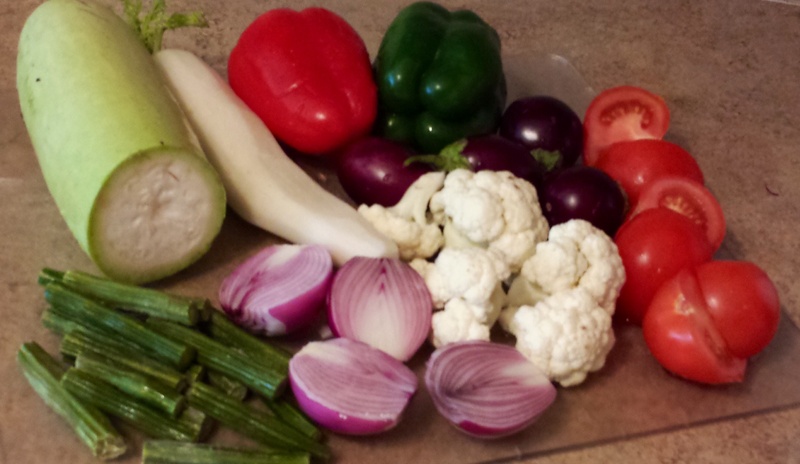 If added right….they all come together to create magic! 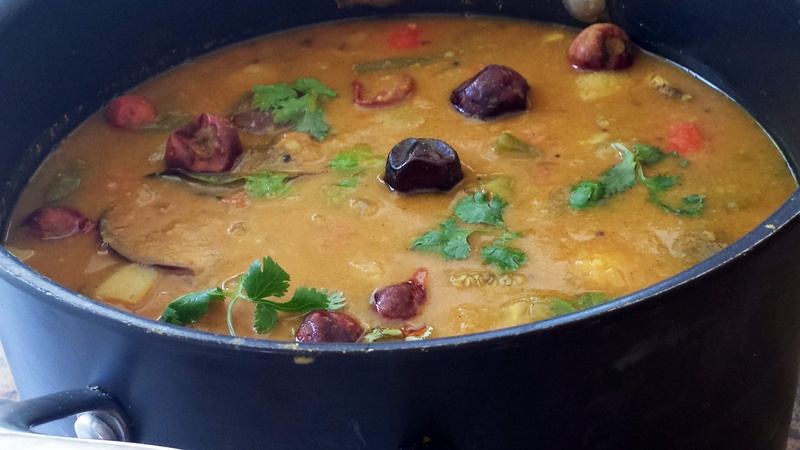 Sambhar has many variations, each one having it’s own special appeal. So here I present, my take on the Masala Potboiler Blockbuster from the South….do give it a try! 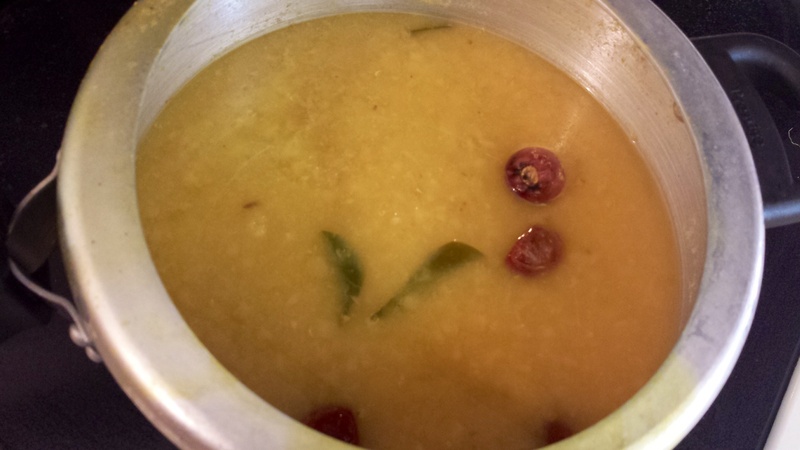 It is best enjoyed with plain rice but serves as a great accompaniment with Dosa, Idli or Vada. 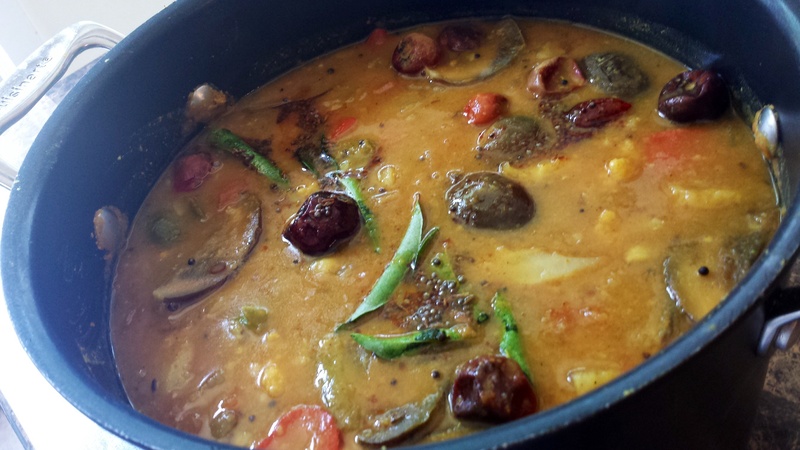 For me Sambhar is a celebration of all my fav vegetables…and I like to include a whole lot! 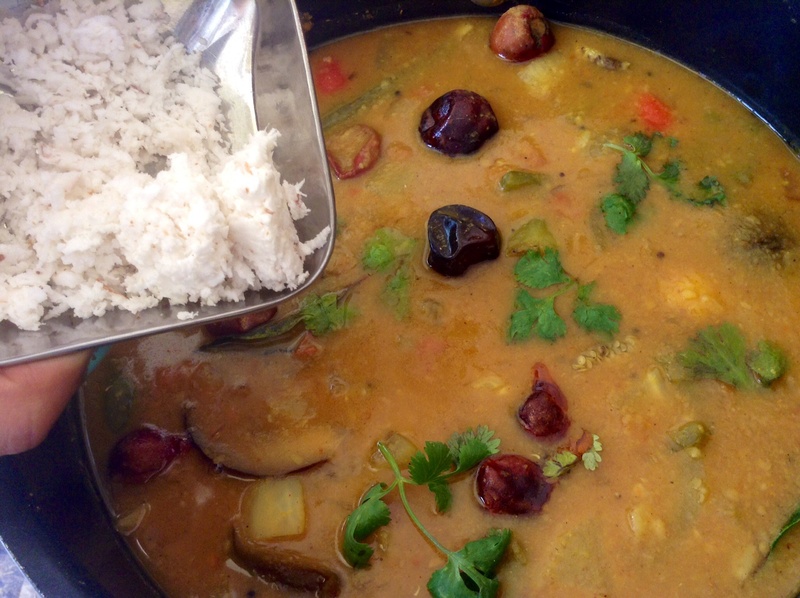 Also, to make good Sambhar you must use a good quality sambhar masala, fresh is best of course. But if you are short of time, you could use any good store bought brand that you favor. I buy mine from the nearby Ganesha Temple that sells freshly made masala in small quantities, thus retaining it’s freshness. 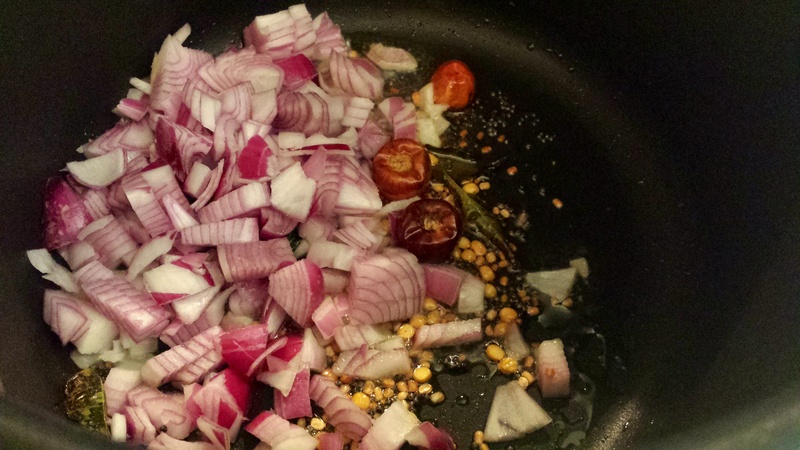 Add chopped onions and sauté for 2 -3 minutes. 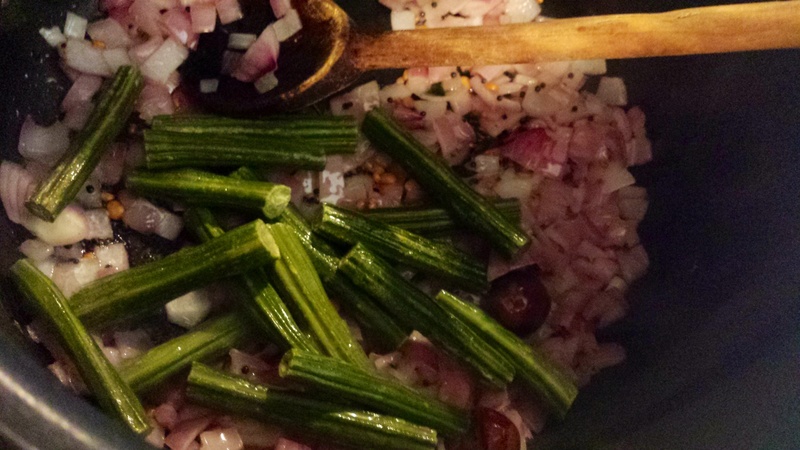 Add the scraped and cut drumsticks and sauté for 3-4 minutes. 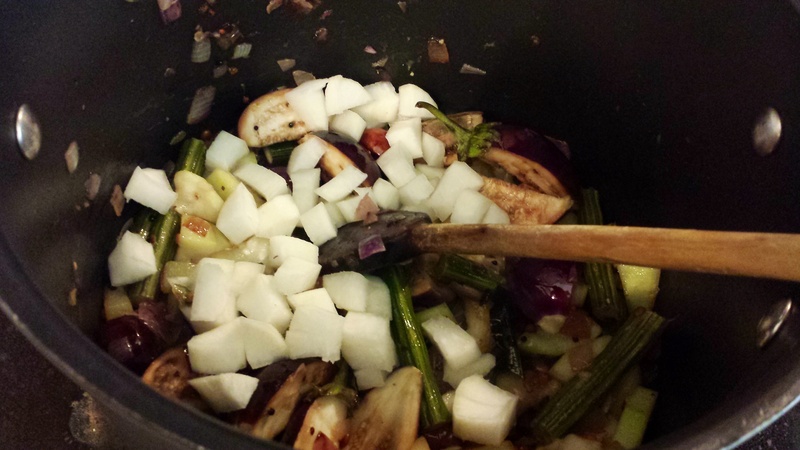 Add the lauki and eggplant and cook for another 2-3 minutes. 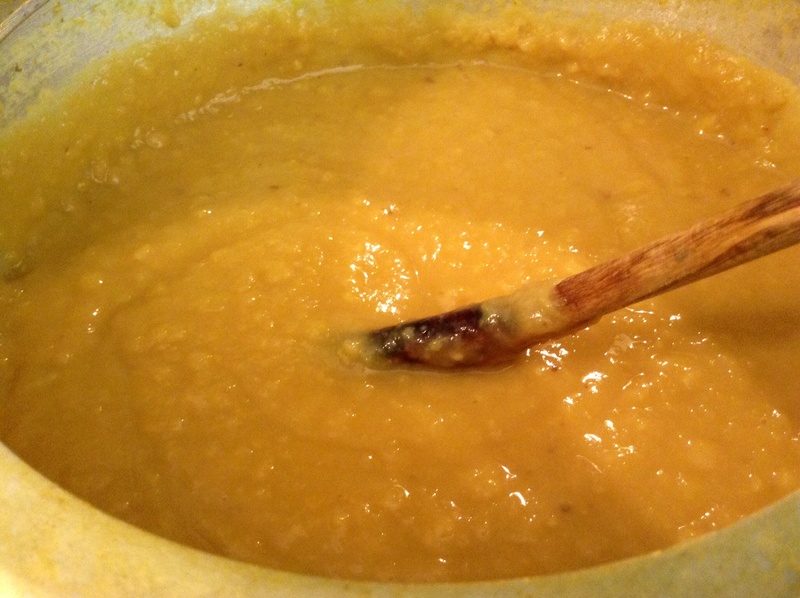 Add the chopped carrot (not shown in pic) and mooli (optional) and cook for another minute. 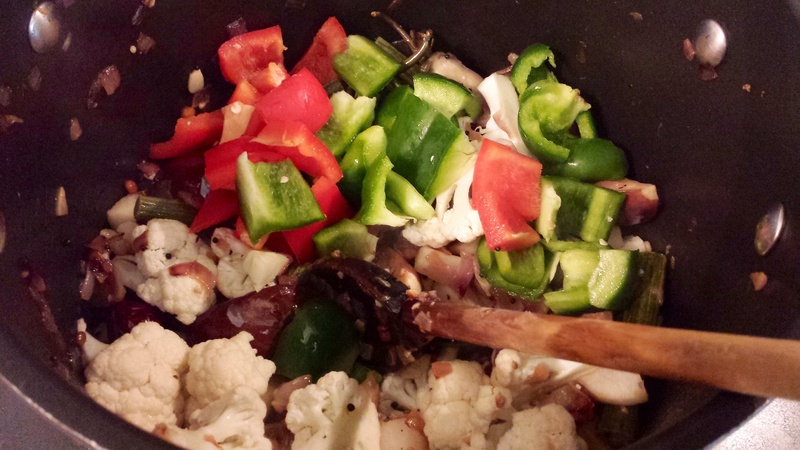 Add the chopped peppers and cauliflower (optional) and cook for another minute. 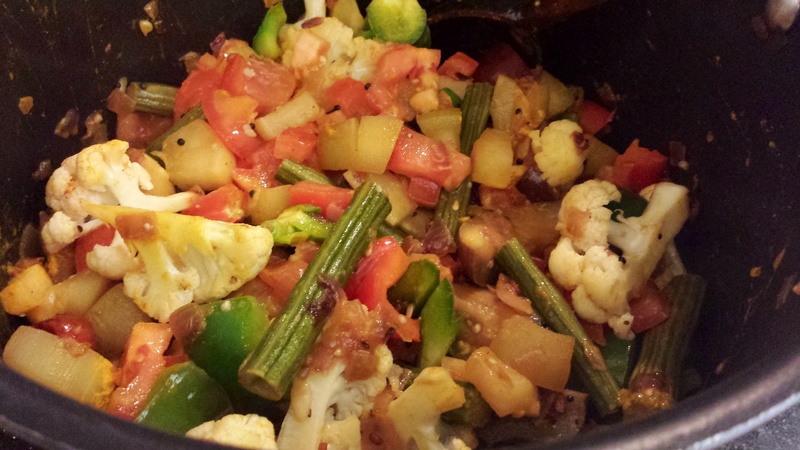 Add the chopped tomatoes, salt and haldi cook till vegetables are almost done. 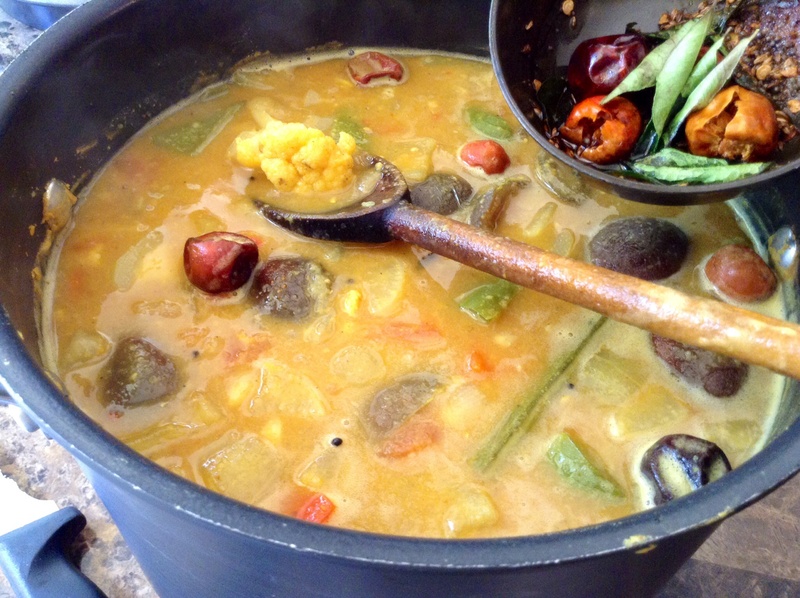 While the vegetables are cooking pressure cook 1 1/2 cup toor daal with some water, salt, haldi, a few curry leaves and 2-3 gol lal mirch for 3-4 whistles. Once the pressure releases, stir vigorously to mash the grain. 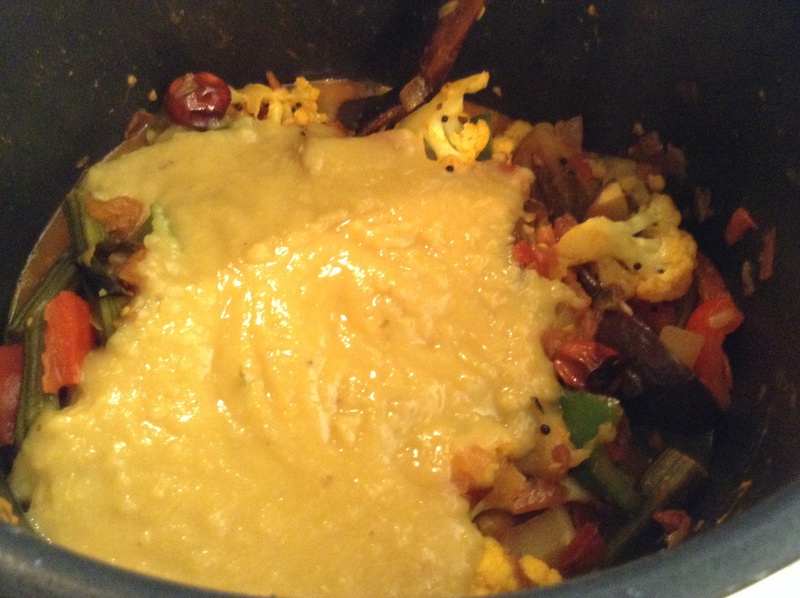 Add the mashed dal to the pot of cooked vegetables. Also add some warm water to thin out the mix. 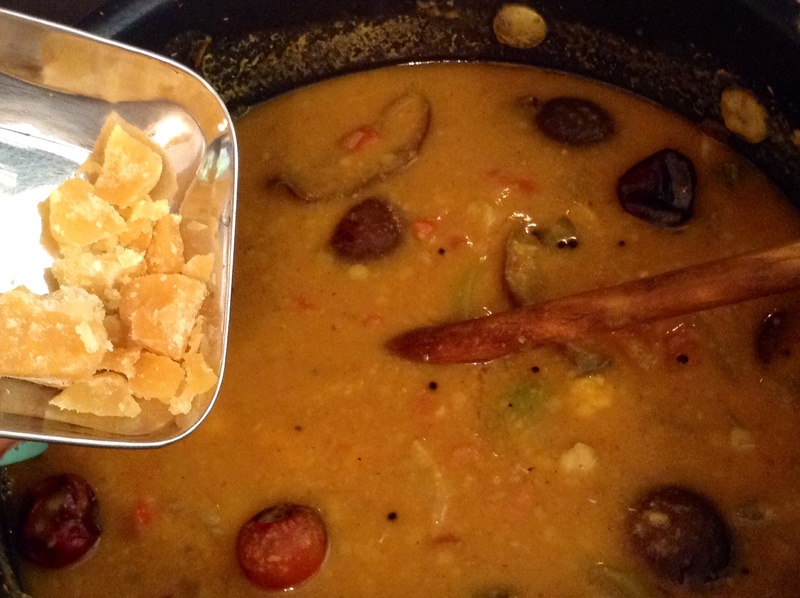 Mix 2-3 tbsp Sambhar masala with a little water and add to the sambhar. 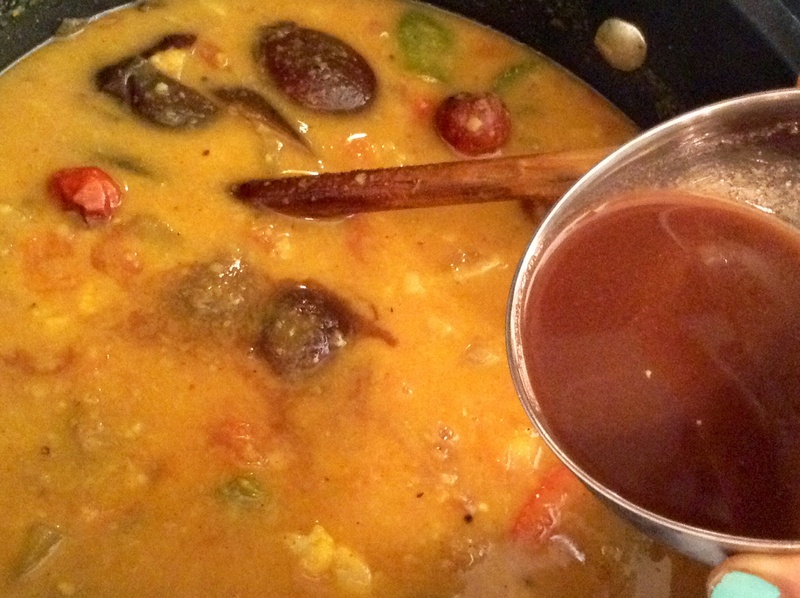 Soak tamarind in some warm water. Strain and prepare concentrate. 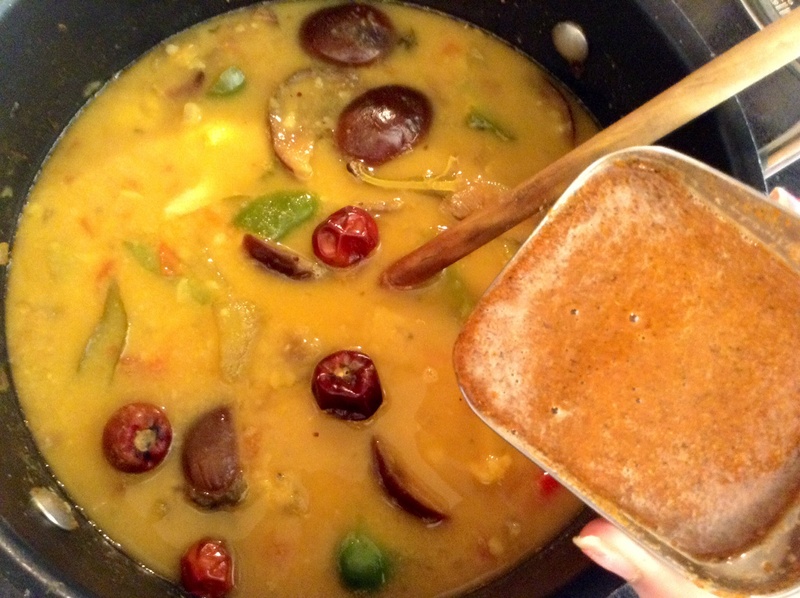 Add some concentrate into the sambhar. 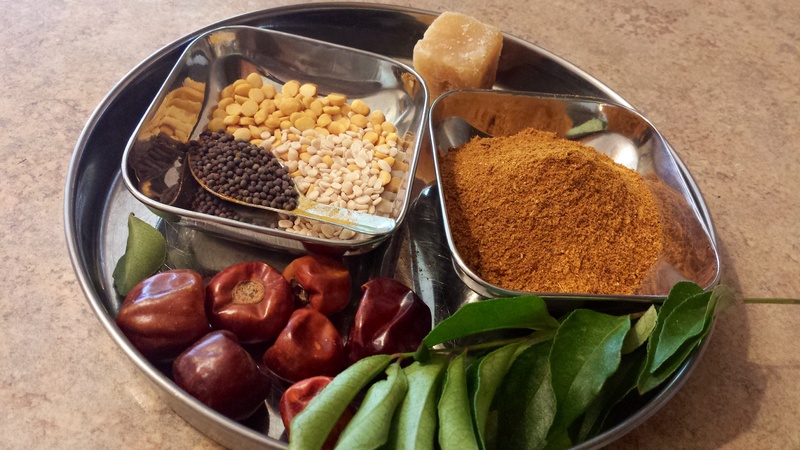 The quantity will vary depending on the sourness of the tamarind. Next add a liitle gur/ sugar. Add sparingly, as a little goes a long way. This is added to balance the tamarind added earlier. 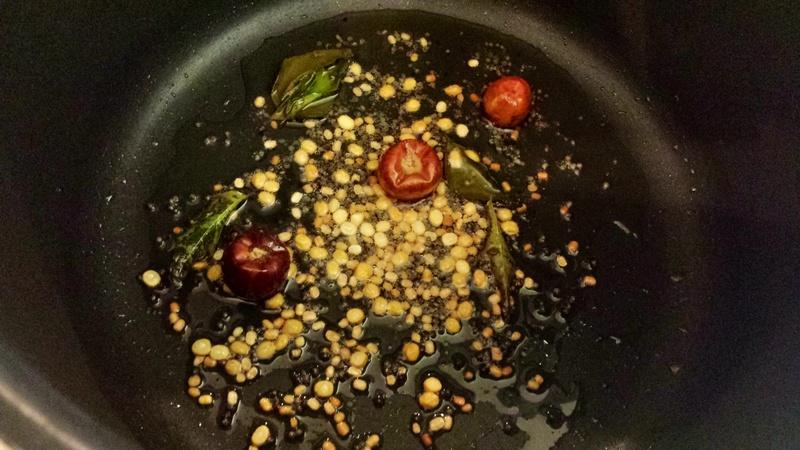 Give a final chaunk of hing, rai, jeera, Chana dal, udad dal, gol lal mirch, karo patta and red chilli pwdr. 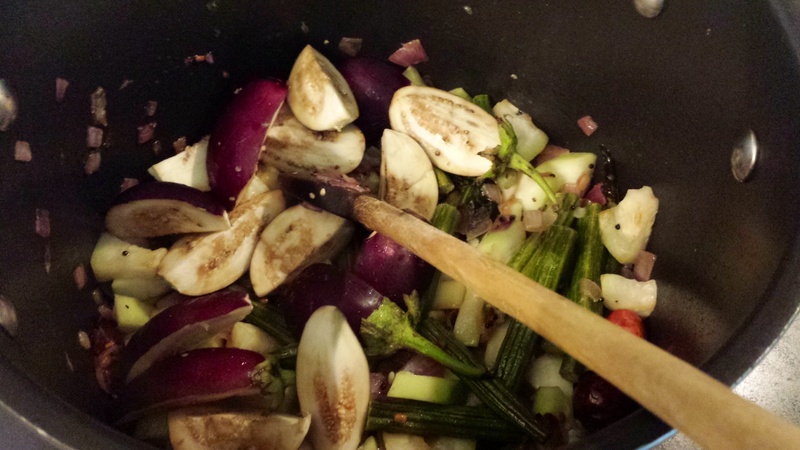 Enjoy this delicious healthy lentil vegetable stew…a great idea for including more vegetables in your diet!